Networking can be stressful for even the most experienced professional. While we are constantly drilled on the importance of networking, attending an event is still a nerve wracking experience for many of us. Yet the importance of networking is drilled into us for a reason. Networking has been found to be the leading source of hire used by hiring managers and therefore is good investment for any professional seeking employment. Never go into a conference or networking event blind. It may seem obvious, but always be sure you understand the theme or subject of the event you are attending. Have the organizer’s defined goals or objectives? Do those goals match yours? Once you’ve chosen an event, try to find out who else will be there. Research the speakers and organizers. Think about what type of professions or job titles may attend based on the goals of the event. Make a list of the people you really want to connect with. Follow them on Twitter, check out their LinkedIn profile – do whatever you can to get familiar with them prior to the event. Networking goals are different for everyone. The key is to make sure your goals are challenging, yet achievable. Plan to have meaningful conversations with 3 or 4 people, not 20. Spending quality time with fewer people is often more helpful than a quick chat with the whole room. Keep in mind, your overall goal should be to build meaningful relationships, not to get a job or sell your product. You can’t expect people to do you favors after one brief meeting. If you establish a strong connection, you’ll have plenty of time to dig deeper later. Start by briefly introducing yourself then direct the conversation back to the other person by asking a question or providing a compliment. Allow them to lead the conversation and practice active listening. Non-verbal communication is key: nod occasionally, keep an open posture and maintain eye contact. Whatever you do, don’t interrupt. Save your questions for when the other person has finished speaking. Don’t direct the conversation to your own interests unless it is relevant to the conversation. If you’ve listened well, you’ll be able to ask engaging follow-up questions. Try something along the lines of, “Your marketing project for X product sounds fascinating. How did you come up with the idea?” This shows you are genuinely interested in the other person’s work. You’ll hurt yourself in the long run if people think you are putting up a front. Strive to be friendly and helpful. For example, suggest a book you’ve recently read they might be interested in or introduce them to one of your established connections. If you can provide value to someone without being prompted, they are more likely to want to reconnect later. Practice what you want to say about yourself or your product, but avoid sounding rehearsed. You should be comfortable enough with your information to be able to modify your “speech” for your audience. Following up after an event is key. This begins at the end of your conversation when you trade business cards. Be sure to ask how your new connection prefers to communicate. Some people prefer email or social media, while others are committed to phones. Follow up within 48 hours with a personalized message. Avoid general messages such as “It was nice talking to you.” Tell them why it was nice to meet them. Bring up a topic you discussed at the event to show you were listening and remind them of your conversation. Remember, if you don’t follow up, you’re not networking. You can’t build your connections without continuing conversation. 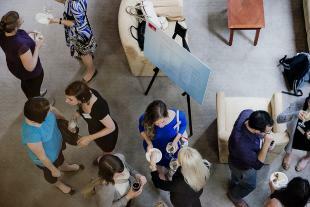 Give these tips a try at your next networking event. If you commit to improving your networking skills, you’ll see results for your hard work. Most importantly, keep practicing and honing your skills. Attend meetups reguarly and check out our networking courses to continue your education. Perhaps in time you’ll be share some of your tips with us!